SACRAMENTO COUNTY, CA (MPG) - The Folsom Bass Team took on the Delta waters on a perfect spring day for a fishing tournament. Boats were launched and fish were weighed in at the Delta Loop’s B&W Resort for the team’s May tournament. Jerry Lawler and Marshal Smith took home first place honors with a big fish of 7.27 pounds and a total weight of 22.03 pounds. Tom Manley and Michael Allen placed in second with a big fish of 5.40 pounds and a total of 19.96. Allen credited Manley for his familiarity with the waters. “He took us to the right spot,” said Allen. Mike Bugliarello and Gabe Luna finished in third place with a total of 15.99 pounds, but it was Bugliarello’s 9.09 pounder that took top big fish honors. Overall, the 19 boats and 38 fishermen caught 88 fish combining for 207.25 pounds on the day, averaging 2.36 pounds per fish. Ryan McGinnis currently ranks atop the team’s Angler of the Year standings, followed by Pat Rounds and Mike Bugliarello. With their second place finish, Michael Allen and Tom Manley have moved into the top 10 overall and now rank eighth and tenth place, respectively. 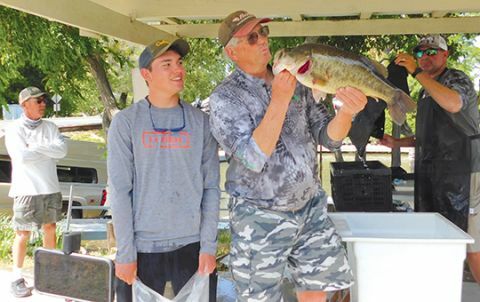 The team’s next tournament is a two day event on June 2 and 3 at Lake Shasta’s Bridge Bay. For more information visit www.folsombassteam.com.